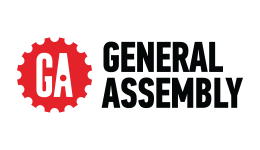 Learn sought-after skills for the 21st century workplace with this practical online Web Development course from General Assembly. Virtually every industry now requires the support of skilled professionals to create and manage websites, and with the practical skills learned in this course, you’ll be equipped to bring creative ideas to life and quickly grow your professional skillset. A big-picture course taught by industry leaders, this course will ensure you build sought-after skills in a flexible online environment, enabling you to immediately grow your career and help build our online world. If you like problem-solving, are a creative thinker, and see things a little differently, this course could be your first step towards a rewarding and exciting career in web design. Upon successful completion of this course, you will obtain a certificate of completion of the Web Development Part-Time course from General Assembly. This qualification will enable you to demonstrate skills, abilities and experience in the sought-after fields of web development and design, and may enable you to pursue new employment in a role relating to web development, web design, user experience design or programming. After completing this course, you may choose to seek employment as a website developer, editor or programmer, or take on responsibilities relating to digital media, digital decision-making and online content development.